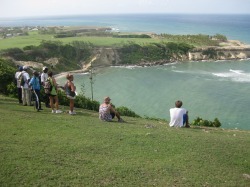 Cove Bay is a site on Northern Barbados with picture perfect coastal scenes. The trail south to Pico Teneriffe is rugged, scenic, with grassy footpaths. We share on the Indentured Servants who lived on this very marginal land. Indentured Servants were subjects of the British Empire who were bound by legal contract to serve a master for a number of years without pay, they came mainly from England, but there were also Irish and Scottish. Many prisoners came as Indentured Servants which was a lesser penalty than death, believing they would survive their indentureship. Their Barbadian masters however had very different plans. Little Bay is north of Cove Bay, this alternative trail is essentially a flat coastal walk along the scenic northern cliffs. DRESS FOR THE OCCASION: comfortable loose fitting clothing, sturdy enclosed footwear, a backpack, personal medication (asthma inhalers etc. 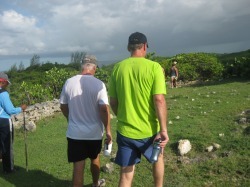 ), drinking water (2 liters), trekking pole (if needed), sun protection - a hat, sunblock.